Mill-Max Mfg., Corp. has developed a line of Horizontal SMT (HSMT) headers and sockets ideally suited for low profile parallel board-to-board or board-to-component mating. 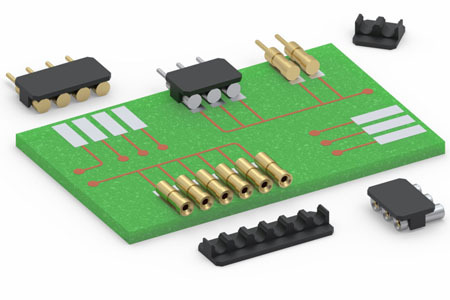 The removable plastic cap provides the convenience of a traditional connector and once removed delivers an interconnect system with a minimal surface mount profile. These new sockets, 835-43-0XX-40-030001, and headers, 328-10-1XX-40-020001 are an excellent choice for applications where vertical board stacking is not an option, such as in LED lighting systems which often employ daisy-chained PCB’s to minimize overall package height. This new series of HSMT connectors have an above-board profile of .096” (2,44 mm) with the cap in place and just .072” (1,83 mm) with the cap removed. The cap serves multiple functions: it maintains accurate pin to pin spacing, enables group placement of low profile SMT pins and receptacles and provides a flat pick and place surface for efficient automated assembly. After soldering, it may be easily removed to achieve a minimal profile. The connectors are single row with .100” (2,54 mm) pin spacing and are available in 2-10 positions. All are packaged on tape and reel (1,450 parts per 13” reel) per EIA-481 standards; tape widths vary with pin count. The removable cap material is high temperature Nylon with an HDT of 260° C to withstand most soldering processes. Each pin and receptacle is precision turned from brass alloy. The receptacle has a highly reliable 4 finger, beryllium copper contact and accepts leads ranging from .015” - .025” (,38 - ,635 mm). The standard plating for the sockets is tin on the shell and gold on the internal contact providing optimal interconnect reliability. The header pins come standard with gold plating.